I have a confession to make – I'm a tea-a-holic. Some people like their fine coffees, exotic wines, but for me, nothing is better than a good cup of tea. In many ways, I think you could say I am addicted to tea. I have so many different varieties of tea in my house that I have to ask permission to buy tea, just because we already have boxes of unopened specialty tea just waiting for the right occasion. I have teas that are meant for the winter, some for the summer, and others that are meant for everyday use in the spring or fall. Even so, I am always trying to find more exotic and fun teas, especially since I was given a tea ball and tea "infuser" (strainer). If you are a serious tea drinker, you already know that loose tea is the best way to go since you can easily adjust the strength and flavor of the tea, especially if you like to experiment like me and mix different types of teas. When I was given the opportunity to review's ITO EN's Ginger Tangerine Rooibos tea as part of their holiday promotion, I can't tell you how excited I was to try it! For those who haven't heard of ITO EN, they are a very well known Japanese company that has been making fine tea products for over thirty years. They are still fairly new in the North American market, founding their offices here in May of 2010. Their goal is to introduce the ITO EN line of tea products and help everyone in the United States and Canada develop an appreciation for their high quality tea. They make a variety of products ranging from bottled teas to specialty loose teas for just about any occasion. As some of you know, I also try supporting eco-friendly businesses, another reason I have fallen in love with ITO EN. They are one of the pioneers of corporate social responsibility and eco-friendly business practices. Over the years, the parent company has won numerous awards from the Japanese government for their environmental policies and eco-friendly packaging. One of their policies that I think is really cool is that the used tea leaves from production are upcycled into other products, including benches, uniforms, pens, and a variety of other products! They also work with Whole Foods non-profit organization, Whole Planet, to alleviate poverty in third world countries. In my opinion, it is great knowing that I am purchasing tea from a company that loves to give back to its community and the environment. One of my biggest complaints when buying tea is that it is usually not visually appealing when you buy it loose. Most companies just throw it in a sealed bag and call it a day. This is the main reason I rarely ever buy tea as a gift, and one area where ITO EN is different. When my box of ITO EN's Ginger Tangerine Rooibos tea arrived from UPS, I had no clue what to expect, but was excited to get into the box. What I found was a beautiful tin in different shades of orange. This metal tin is visually appealing and something that I truly wouldn't mind sitting out on my account along with my other canisters. Now, as someone who enjoys tea, my first concern was how was it packaged inside and was the tin just for look. To my surprise, the top seals in such a way that it lets very little air into the can itself, allowing your tea to stay fresher while opened. Just like coffee, tea can lose its flavor over time due to air exposure, making it important that you keep it in a dark, cool, and air tight environment. 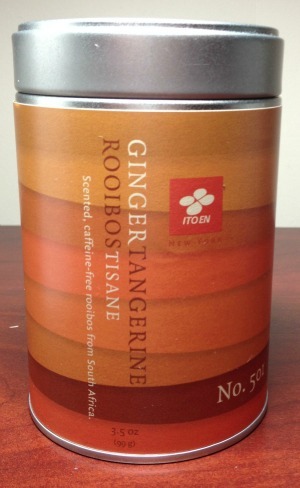 ITO EN seemed to be thinking ahead with their ITO EN's Ginger Tangerine Rooibos tea packaging. 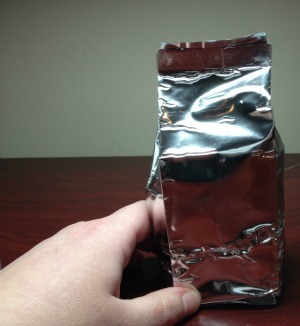 Once you open the tin, it isn't too surprising that the tea itself is in a vacuum sealed package. Since this tea is very fine, I highly recommend cutting with a scissor or very carefully opening it from the top seam. This is very fine tea so if you are a bit too aggressive, you WILL make a mess – and more importantly, waste the excellent tea! 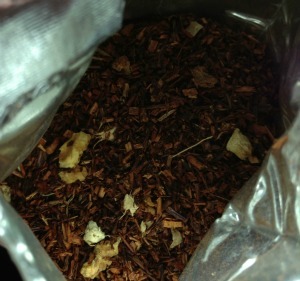 I will be totally honest with you, ITO EN's Ginger Tangerine Rooibos tea is unlike any other tea I have tried. Most of the unique flavor is attributed to the South African Aspalathus Linearis plant. From what I've read, the leaves from this plan are like fine needed leaves, making the tea itself fairly fine. With the mix of ginger and tangerines, you are left with a very colorful tea that is a mix of orange and brown, just like the colors of the tin itself. Below, is a picture of some of the tea itself, both in the bag. Since this is such a fine tea, it is very important that you have a good tea ball or tea strainer. Below, I have pictured of both of these products. Both work just fine with this tea. The trick to making the best cup of tea with this tea is similar to making other types of tea. You need very hot water and patience. Personally, I prefer to use a tea pot since it gets the water to the right temperature without overheating it. Water that is too cool leads to the tea not steeping properly. For this tea, put 1 teaspoon of the tea into a tea strainer or tea ball. For a six ounce cup, steep the tea for two to three minutes. While you may be tempted to drink the tea immediately, I recommend letting it sit for about five minutes to let the tea properly cool, allowing you to enjoy the flavor without burning your tongue. As for the flavor of the tea, I absolute love it! It is a smooth tea with a bit of a sweet aftertaste. With a bit of sugar, you can easily taste the tangerines, with a slight hint of ginger. I was worried that the ginger would be overpowering, but it very nicely compliments the rest of the tea. ITO EN's Ginger Tangerine Rooibos tea is a very nice, smooth tea that isn't too rich and perfect as an everyday treat or as a nice tea with an afternoon snack! 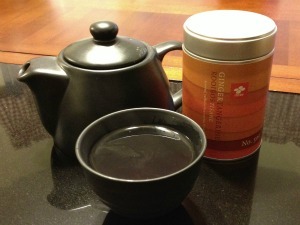 Interested in trying ITO EN's Ginger Tangerine Rooibos tea for yourself? It is currently being sold on the ITO EN's website 3.5 oz tin for $12. ITO EN also sells their specialty tea in seven other flavors – Golden Oolong, Sencha Green, Gyokuro, Darjeeling, Ceylon Breakfast, Genmai Green, and Jasmine Green. Since some of these teas do feature different ingredients, they do vary in price, ranging from $12 – $45 for a 3.0 – 3.5 oz tin. To see all of their offers, feel free to check out their packaged tea tin section at their online store. For deals on their tea, make sure to check out ITO EN's Facebook & Twitter page. If you have someone in your family who loves tea, they would love finding this specialty tea in their stocking or wrapped up with a nice tea pot set. I am one of those people who believe very strongly in giving gifts that go with the individual. Any tea lover would love getting a fun, unique tea pot along with a beautiful tin of Ginger Tangerine Rooibos tea. While you can buy gift packs with different types of teas, I highly recommend making a custom set for your favorite tea lover. Pick a selection of two to three tins, and package them with a cute tea pot that goes with their own unique decorating style. One of my favorite gifts was actually the cute little tea pot pictured below, which my little sisters gave me years ago as a Christmas gift. If you want to give an elegant, unique gift this Christmas, I highly recommend putting together a gift pack with ITO EN's Ginger Tangerine Rooibos tea as a centerpiece of your gift set! Disclosure: Budget Earth did not receive monetary compensation for this review and giveaway, but did receive a 3.5 oz in of ITO EN's Ginger Tangerine Rooibos tea for review purposes via Tomoson.com. All of the opinions on this blog are the opinions of said author and these opinions may differ from your own. 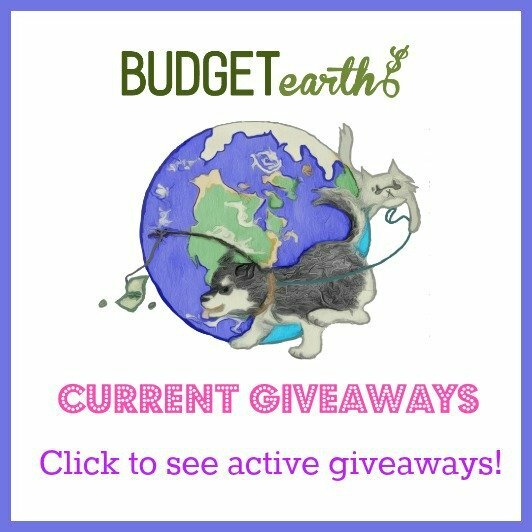 Budget Earth is not responsible for sponsor prize or prize shipment. Sorry about that! You did exactly as you should have Rachel and good luck! Honestly I don't know much about tea or coffee, lol! I love hot chocolate 🙂 Ginger tangerine sounds like it would smell really good though! My family loves tea – checking out their website right now. I love tea! Earl Gray is my favorite but this one sounds great, will have to try it! Thanks for the giveaway! I would love to try the peach roobis loose tea! Sounds like a good tea. I am not a tea drinker but I know some folks who love their tea. Ginger is supposed to be very soothing for the stomach. I have had their tea since I was in Japan. It is delicious. Which is why I wouldn't mind winning some! The ginger tangerine combination sounds absolutely delightful! My husband is a tea fanatic so we'll have to try this brand out! Hope we win! I can't drink soda or coffee, but I still am able to enjoy tea. I would love to win this, it sounds so delicious. I absolutely love tea. This blend sounds amazing! My son loves to drink tea and really enjoys trying different flavors. I will have to check this out. Great review and giveaway! Thanks for sharing! This tea sounds wonderful! I love tea. Thank you for Sharing.. I must admit I'm not a roobios fan, but I wonder if I would like it with the tangerine? we all know the health benefits of tea. its the reason why i want to win this. I don't normally drink tea though but i want to try and perhaps change my drinking lifestyle. instead of coffee i will switch to tea. I can almost smell it, it looks so good! I've only recently started getting into tea. Much easier on my tummy than coffee. Thanks for sharing! Mmmmm! I love tea! Not sure I have tried this kind before. Thanks so much for sharing! I am not a huge fan of tea, but this actually sounds pretty good! we are huge loose tea drinkers here. This sounds beyond yummy! I love ItoEn. I was introduced to them at Coffee Fest back in 2005..i have been hooked since. My fave is Jasmine green. I buy their Green tea (bags) from Costco. I like tea. I like ginger. I want to try this one. They make good stuff. I would love to win a tin of ITO EN Ginger Tangerine Rooibos tea because I love tea, and Ito En! I would love to try one of their new flavors! My son and I love tea.. I usually buy my tea from Teavana but its so expensive. We also have a all the products needed to make this tea. My Fiancee and I love tea so much. We keep a good variety in the one at one time and we would love to try any of ITO EN's teas. Herbal tea breaks are a great and healthy way to relax! I should win bc I have tea time every afternoon and this sounds like a fun flavor!